Patient is a 10 yr old, MN, Shih Tzu that presented for cervical pain and ataxia (unresponsive to medications) of approximately two weeks duration. Physical exam revealed CP deficits affecting both pelvic limbs but deep pain was still present. A CT myelogram of the thoracic and lumbar spine was requested for further evaluation due to suspected intervertebral disc herniation. Patient was anesthetized and a CT scan of the thoracic and lumbar spine (including the thorax + abdomen) was performed. Afterwards, a myelogram with Omnipaque™ (contrast agent) was performed and a post myelogram CT of the thoracolumbar spine was acquired. 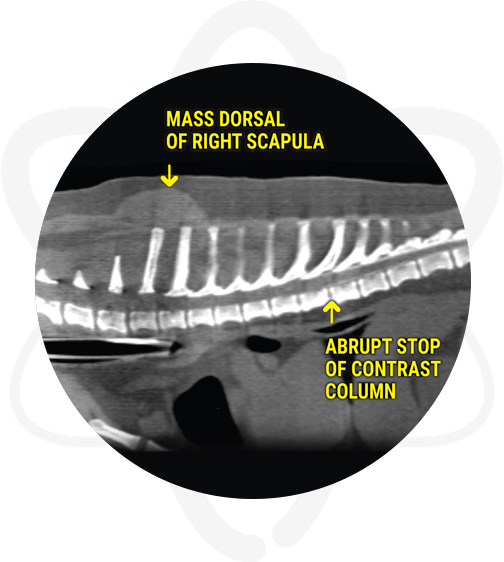 Paravertebral mediastinal soft tissue mass with extension into the vertebral canal with extradural compression. Consistent with neoplasia with multifocal severe metastatic disease. Multifocal lymphadenopathy, multiple pulmonary nodules, mass dorsal to the right scapula, and multiple subcutaneous nodules. Consistent with metastatic neoplasia. Thoracolumbar intervertebral disc disease with mild right ventral bulging/herniation with mild compression at L2-L3 and to lesser degree L1-L2, T13-L1. These may contribute to neurologic deficits, but the paravertebral mass is the likely cause of the main clinical signs. CT found a mass that was missed on radiographs which explain the history of pain and ataxia. CT also discovered evidence of metastatic disease. When it comes to neurological disease, case selection includes pets with trauma to the cranium or spine, suspected intervertebral disc disease, conditions affecting the integrity of the axial skeleton and tumors that are outside the blood-brain barrier (pituitary, some meningiomas, etc.) which therefore enhance strongly post contrast. 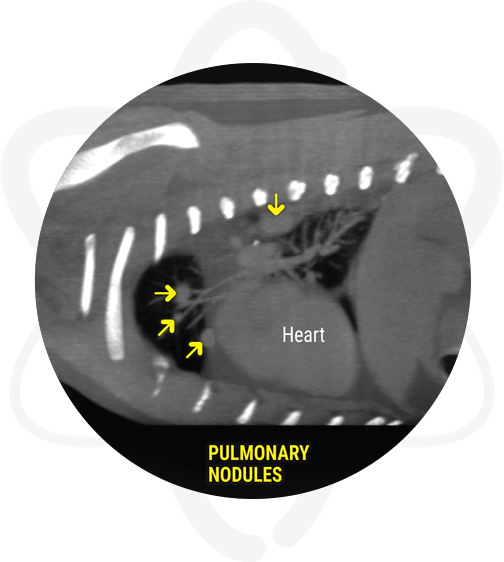 As shown in this case, when compared to X-rays, CT has several advantages including the ability to remove superimposed structures, allowing cross section evaluation of the anatomy, and assisting in the differentiation of small variations in the density of structures.